Lance Armstrong has been stripped of his seven Tour de France titles and given a lifetime ban by the United States Anti-Doping Agency (USADA). The US cyclist opted not to contest USADA drugs charges, saying he is tired of fighting the allegations. He strongly denies doping. The International Cycling Union (UCI), the world governing body, is yet to say if it intends to follow USADA's lead. It previously backed Armstrong's bid to challenge USADA powers over the sport. USADA said Armstrong's decision not to fight the charges against him triggered the lifetime ban and led to his results dating back to 1 August 1998 being erased. 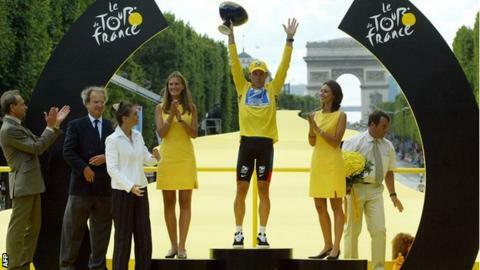 He won the Tour de France in 1999, 2000, 2001, 2002, 2003, 2004 and 2005. Armstrong retired from cycling in 2005 but returned to the sport between 2009 and 2012. USADA says 10 of Armstrong's former team-mates are prepared to testify against him. On Monday, he failed in his attempt to block the charges in a US federal court. He claimed USADA was acting beyond its remit and had offered "corrupt inducements" to other riders to testify against him. "If I thought for one moment that by participating in USADA's process, I could confront these allegations in a fair setting and - once and for all - put these charges to rest, I would jump at the chance," said Armstrong. Armstrong, who survived testicular cancer prior to his record-breaking Tour wins, said he would now be focusing on working with his cancer charity. It alleges he used banned substances, including the blood-booster erythropoietin (EPO), steroid and blood transfusions, as far back as 1996. "I have spoken to [Armstrong]. He is out doing a mountain bike ride right now. "The support from our sponsors, donors and cancer sufferers has been overwhelming since the news broke. "Donations are up this year on last and today on yesterday." "As part of the investigation Mr Armstrong was invited to meet with USADA and be truthful about his time on the USPS team but he refused." Throughout the case, the UCI had challenged USADA's jurisdiction over the sport, and has the option of appealing against the ruling to the Court of Arbitration for Sport. However, it stated earlier on Friday it would not take action until it had received details from USADA explaining why Armstrong should lose his titles. Earlier John Fahey, chief of the World Anti-Doping Agency (Wada), said Armstrong's seven Tour de France titles should be "obliterated" following his decision not to contest the doping charges against him. In a statement following USADA's decision, Wada said it would continue to monitor the process. The Tour de France organisers said they would wait for an outcome in any stand-off between USADA and the UCI before taking action.